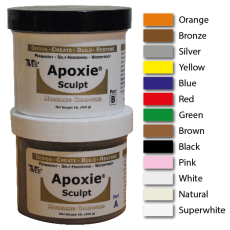 Apoxie® Sculpt is a smooth, putty-like modelling clay that has the adhesive properties of epoxy . Self-hardens and cures 24 hours to a semi-gloss finish. Perfect for modelliling and sculpting, embellishing, bonding and filling most anything. Apoxie® Sculpt can painted or stained for a variety of finishing options. Due to the tough finish, the sculpted item can be refined by sanding, drilling, carving, or finishing on a lathe without chipping, cracking or flaking. Apoxie® Sculpt hardens to an exterior quality finish when fully cured. Available in 13 colours as shown. Note: Colours shown are approximate and may differ from those displayed on screen.